This bright, comfortable studio apartment on Neubergerjeva Street is situated in a quiet neighborhood Zupanciceva jama with pleasant small cafés and shops, less than 1.5 km from the main square in the historical centre and just a step away from Gospodarsko razstavisce (main fair & exhibition ground), large playground for the kids and main wine store. 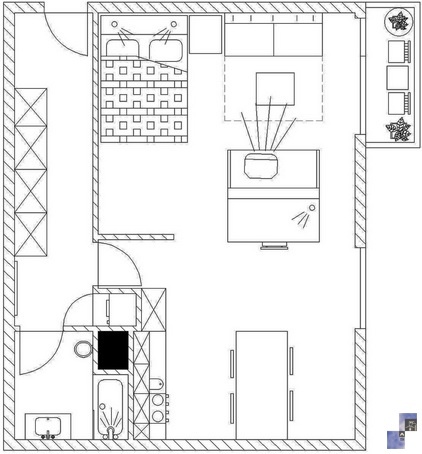 This modern studio has a room with bed (160 x 200 cm); there is a sofa next to it, which falls down to a bed (140 x 200 cm) and is air-conditioned. Sleeping area is connected to kitchen with dining table. Kitchen is equipped with kitchen utensils, cutlery, kitchen stove with oven, dishwasher and spacious refrigerator. The room has an exit to a covered balcony. 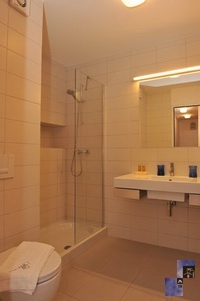 Bathroom is equipped with shower, toilette and washbasin. There is also a washing machine in the apartment, LCD TV, CATV, telephone, free broadband wired and wireless (Wi-Fi) internet access, iron along with ironing board, hairdryer, bed linen and towels are provided. 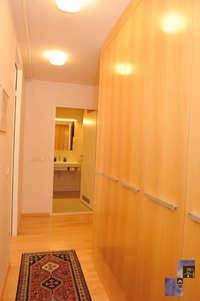 The apartment is on the 2nd floor with elevator access and has a parking space in the underground garage (only for personal vehicles that do not exceed the usual size of 5m) - daily price is 12 €, monthly price is 120 €. Reservations must be made in advance. It is forbidden to smoke in the apartment! We stayed 3 days in Lubiana, had a very nice time.